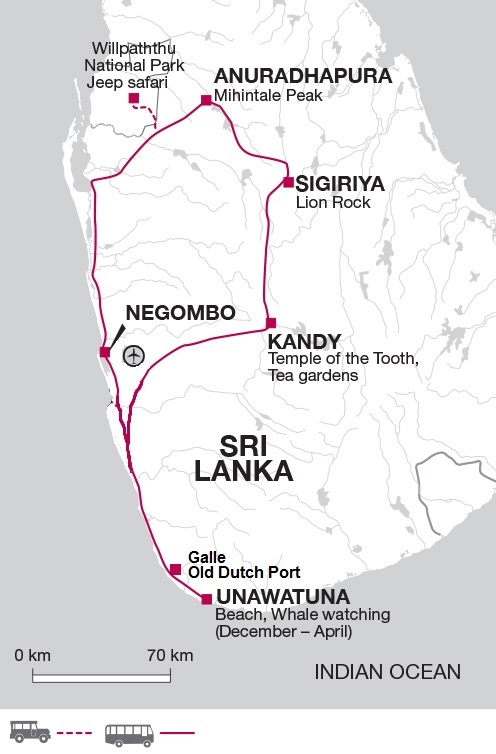 This week long exploration of Sri Lanka packs in a wealth of highlights across this beautiful island. Discover sprawling ancient capitals, giant Buddhist statues, intricate temples, national parks teeming with wildlife and white sand tropical beaches. 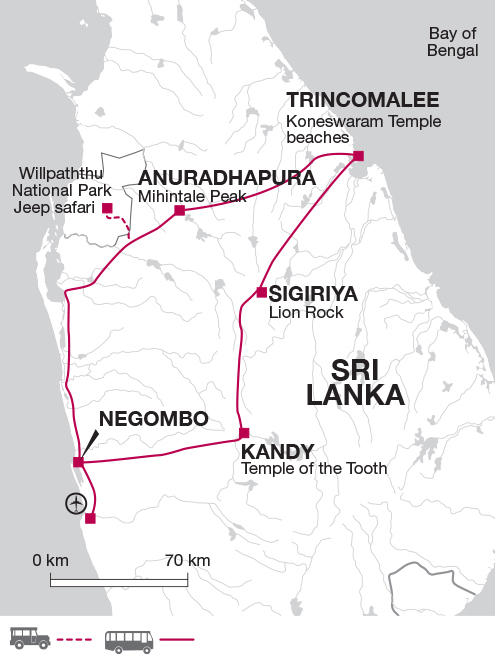 Our tour begins this afternoon in the coastal town of Negombo, famous for its fishing industry and golden sands. Our hotel is just a 15 minute drive north of the airport. From its beach location, we are likely to see fishing boats bring in the day's catch. We may also be treated to a stunning sunset over the ocean. Leaving Negombo we travel north following the coastal road via the small towns of Chilaw and Putalam before reaching the entrance to Wilpattu National Park. Here we will leave our bus and change to jeeps for an afternoon safari through the park hoping to spot Sri Lanka's most elusive resident, the leopard. Despite Wilpattu National Park's location in Sri Lanka's dry zone, it boasts nearly 60 lakes and is renowned for leopard, elephant and sambar deer spottings. We choose to visit this park, rather than Yala National Park further south because we believe it offers our customers a better experience. The same animals can be seen here as in Yala and despite being busy in places it is overall less crowded, making our visit more enjoyable and responsible. It is also worth noting that wildlife is unpredictable and therefore sightings cannot be guaranteed. Leaving the park, we drive to nearby Anuradhapura, where we will spend the night. We start this morning with a visit to the mountain peak of Mihintale. It is believed that this was the site of a momentous meeting between the monk Mahinda and King Devanampiyatissa, introducing Buddhism to the country. Exploring Mihintale involves climbing a flight of 1,840 shallow stone steps leading to the summit of the Missaka Mountain. There are excellent views from the top looking back to Anuradhapura. After the exertions we board our bus and drive to Trincomalee on the east coast of the island. We visit the Koneswaram Temple, which dates back to the 3rd century BC and the ornate design is similar to that of the coloured carved temples of Madurai in South India. After exploring the temple we make our way to the beach and the rest of the day is free to relax. Today is left free for you to relax on the beaches of Trincomalee. The waters on the east coast are particularly calm and shallow, in some areas you can walk almost 100 metres in to the sea with the water only being waist height. Alternatively you could take a short tuk tuk ride in to the town and explore the fort area, built in 1623 by the Portuguese and then captured by the Dutch less than twenty years later. Today we leave the coast and head inland. We swap our bus for a bullock cart and make our way slowly through a small village on the outskirts of Habarana. Reaching the lake we change seats again and use dugout canoe style boats - adapted with seats for a more comfortable ride! - to cross the short distance across the lake to Hiriwaduna Village where we are met by the villagers and treated to a traditional Sri Lankan lunch. Here we will enjoy various different curries and fluffy rice and after our meal and spending time in the village we make our way to Sigiriya, stopping on the way to visit Dambulla, where a great series of caves have been turned into temples dating from the 1st century BC. This World Heritage Site still attracts scores of worshippers. We will visit five separate caves, which contain a large number of Buddha images and sculptures of Hindu Gods. An early start this morning as we plan to climb Sigiriya Rock ahead of the crowds and whilst it is cool. The ruins of this 5th century Sky Fortress are one of Sri Lanka's major attractions, a stupendous sight to behold and a feat of consummate engineering skill. Built in just seven years as a fortified palace to protect the reign of merciless King Kassapa, who had assassinated his father and deposed his brother, it is seen as one of the world's best preserved examples of ancient urban planning. Unfortunately for the king, despite its impregnable reputation, he was defeated here by his brother after a reign of just 18 years. A switchback series of steps and steel stairways ascend to the top. Halfway up, tucked beneath a sheltering overhang of rock, are the famous frescoes - the Sigiriya Damsels, their colours still glowing. Before our final ascent to the summit, we pass between a set of enormous lion paws carved out of the rock - all that remain of an ancient gateway that gave Sigiriya, the Lion's Rock, its name. Once at the 200 meter summit, magnificent views can be enjoyed of the surrounding jungle and countryside. This afternoon, a two-hour drive takes us to Kandy. On arrival the time is free to explore this historic town. Perhaps visit the Temple of the Tooth, situated on the shore of the lake or take a short tuk tuk ride out to the Peradeniya Botanical Gardens which alongside beautiful displays of Sri Lanka's finest flowers is home to thousands of flying foxes. After breakfast this morning we drive back to Colombo Airport where our tour ends. Year round high temperatures in coastal regions: Colombo averages 27°C. It is much cooler in the hills with Kandy averaging 20°C and Nuwara Eliya down to 16°C. Springlike temperatures in the hill country, but chilly evenings. Two monsoon periods: Apr-Sep when rain is confined to the southwest; and Oct-Mar when it falls in the northeast. Select your clothes carefully, bearing in mind that the climate is tropical and that upland areas are cooler and more temperate. Lightweight rainwear is also essential, and warmer clothing for the highland walks and chilly night temperatures in the mountains. When visiting religious sites you will need to dress respectfully by covering you knees and shoulders plus taking off your shoes and hats. You may like to wear socks for temple visits as the ground can get very hot and burn the soles of your feet. You will need to bring long trousers, or buy a sarong locally. Accordingly you should allow approximately £25. Yes, usually in major towns. Credit cards can usually be used in most large shops and restaurants. Please note that Foreign Office advice warns about the problem of credit card fraud in Sri Lanka so please consider this when deciding if to pay by card while on tour. Are not easy to change and where they can be changed the exchange rates can be poor. Accommodation in Sri Lanka can be varied and on our trips we stay in a mix of hotels, heritage properties, camp sites and homestays. Standards do not equate to standards in the UK and it's best to approach each type of accommodation with an open mind. Service can be slow in places especially when travelling with a group. Hot water is not always available 24 hours a day in some of the smaller properties, and with a group staying you might find if you are showering last you may miss out on the hottest water. Traditional Sri Lankan cuisine is excellent, and although it can be very spicy there are many dishes that feature cooling coconut milk or have a spicy sambar on the side to allow you to adjust the meal to your taste. There isn't a culture of eating out in Sri Lanka, most locals will eat at home, and as such there are very few restaurants around, and those that exist tend to be in hotels. As tourism develops a few independent restaurants are beginning to appear, mainly in Colombo but also in Kandy, Galle and in the coastal resorts. During the tour we will endeavour to eat out at local restaurants wherever possible but for many nights, at this point in time, the hotel restaurants are the only option available. Sri Lanka: All foreign nationals who intend to visit Sri Lanka for a short stay of up to six months, including transit passengers, must apply for travel authorization online prior to travel to the country. To obtain an Electronic Travel Authorisation (ETA) you must visit http://www.eta.gov.lk to apply for it prior to travel. It is strongly recommended that you print and bring a copy of the ETA approval notice with you. The Sri Lankan authorities require that your passport must be valid for at least 6 months after departure from Sri Lanka. Nothing compulsory, but we recommend protection against malaria, tetanus, typhoid, hepatitis A plus Polio and diptheria. Consult your travel clinic for latest advice on different prophylaxis available against malaria. We strongly recommend the wearing long sleeved shirts and the liberal application of insect repellents containing DEET as a precautionary measure to avoid being bitten by mosquitoes. These precautions should be taken at all times as the mosquitoes are also active during daylight hours. Please check the latest requirements with your travel clinic or doctor prior to departure. The above is not an exhaustive list. Further information regarding vaccinations and travel health advice can be found by following the NHS and NaTHNaC links at Explore Travel Health and from your local healthcare provider. Visa and vaccination requirements are subject to change and should be confirmed by you before travelling. Why not extend your holiday with a few days on the beach at Unawatuna or week sailing around the Maldives on our Dhoni Cruise?